[ Andrew Halliday, Scottish journalist. ] 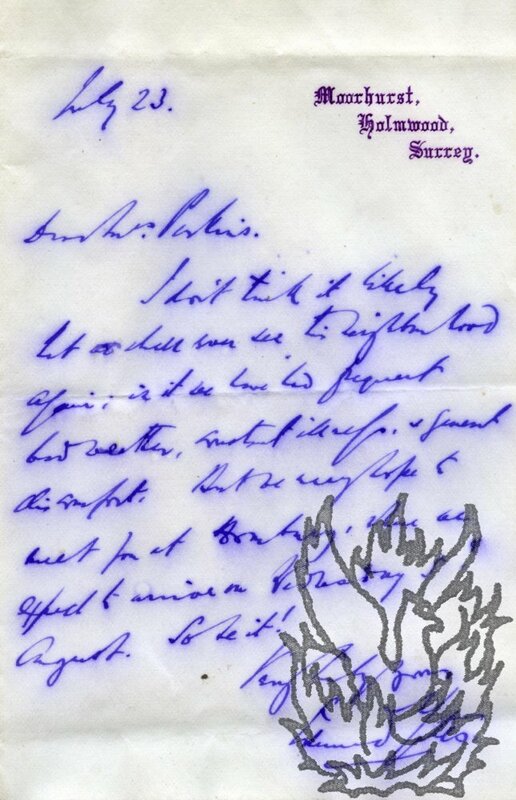 Autograph Letter Signed to 'Dear Teget' [ W.B.Tegetmeier, naturalist ], asking to see him regarding something to his advantage in his 'own line'. 122 Camden Street N. W. [ London ]. 'Tuesday Evg' [ no date ]. [Fred Walker & Thackeray] Album of work by Frederick Walker, Social realist painter and illustrator, described by Sir John Everett Millais as "the greatest artist of the century" (Wiki). 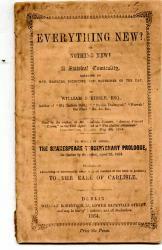 The volume contains proofs of Walker's contributions to various periodicals, with other items by Walker. 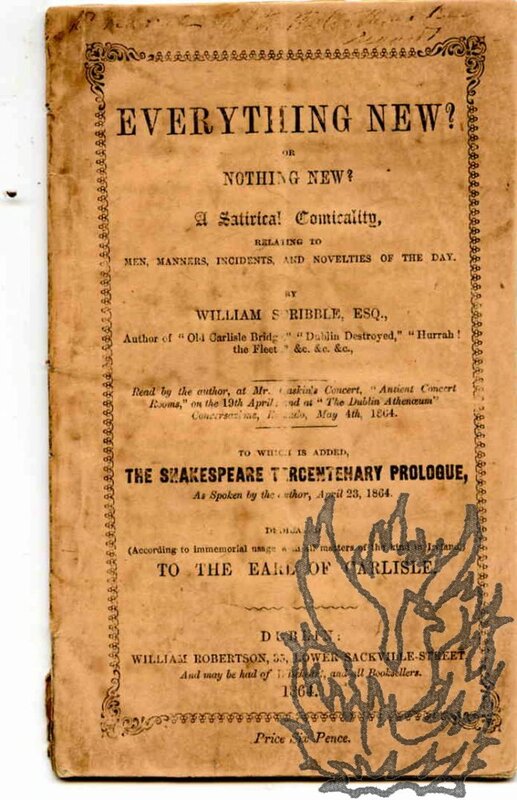 WITH letters/text/drawings (details below) by Thackeray relating to his The Adventures of Philip (Cornhill Magazine, 1861-2, serial), with relevant proofs.Marks states in his introductory comment to his "List of Illustrations" that "Those [illustrations] against which no owner's name appears have been supplied by the author." On that basis, several illustrations in this album belong to Marks's own collection (eg. [Malcolm Elwin, biographer and critic.] Two Typed Letters Signed, the first to the bookseller J. G. Wilson, regarding a meeting before the publication of his 'Thackeray book', and the second to Wilson's firm, Messrs J. & E. Bumpus, London. Both on his North Stoke, Oxford, letterhead. 11 and 13 September 1932. Both 1p., 4to, and both in good condition, on lightly-aged paper. ONE (11 September): He is writing regarding Wilson's 'kind suggestion that I should call in and see you one day shortly before the publication of my THACKERAY book'. Having been told by 'Mr. Hartley' that Bumpus is on holiday, he will call on 14 September. TWO (13 September 1932): Presumably with his tongue in his cheek, he writes: 'Dear Sirs, | Thank you for your letter of yesterday, reference II,456JGW, and for saving me the risk of a fruitless visit. I will call to see Mr.
[F. G. Kitton, Dickensian.] Autograph Letter Signed and Autograph Card Signed (both 'F. G. Kitton') to Winfield S. Moody, editor of The Book Buyer, discussing the claim that Dickens's works were written by Herbert Spencer', and a query on Thackeray. Both items from Pré Mill House, St Albans, England. 19 and 27 March 1999. LETTER: 3pp., 12mo. Bifolium. In good condition, on aged and worn paper. Kitton writes that he has received two copies of the Book Buyer for March, and is 'much interested' in it for two reasons: 'Mrs. Garlands flattering comments upon myself and my work', and 'a very generous notice of my latest Dickens production'. He finds illustrations 'excellently reproduced', and praises 'the careful attention that has obviously been bestowed upon the preparation of both blocks and letterpress'. Turning to another matter, he notes 'a query (no. Autograph Letter Signed ('Helen F. Martin') from the English actress Helen Faucit Martin, Lady Martin, to Mrs Paget, arranging a visit. 31 Onslow Square. 27 May [no year]. Autograph Letter Signed ('A. Ritchie') from Anne Thackeray Ritchie (Lady Ritchie), daughter of William Makepeace Thackeray, to Miss Grae of St Andrews, thanking her for her sisters' book of sonnets. 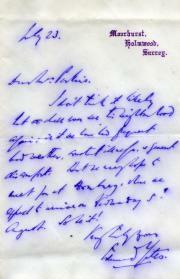 On letterhead of 109 St George's Square, SW. 5 November [no year, but before her husband's death in 1912]. 4pp., 12mo. Bifolium. Good, on lightly-aged paper. As she 'cut the string' of the parcel, she 'wondered what could possibly come to me from St Andrews', '& lo! these beautiful thoughts in their lovely garb appeared to my delight'. It was wonderful of Miss Grae to 'think of it', and of 'the little girls to make such a beautiful book', the binding of which her husband finds 'admirable & excellent'. She will 'read the charming pages on foggy days such as these'. She wishes that 'these last 3 blacknesses had been spent at St Andrews by all of us'. 28 August 1886; on letterhead 1 York Street, Covent Garden, London. One page, 12mo. Very good on lightly-aged grey paper. Reads 'Dear Sir. | Here is the autograph you require. | Faithfully your's | [signed] Edmund Yates'. The words 'Here' and 'to' are slightly smudged. Autograph letter signed to a "Mr Speilmann"
One page, 4to, arsing from his choice of items for his edition of Thackeray's works which Spielmann considers "indiscreet" because of their anti-Catholic posture, "but I believe not one in a hundred will read the minor items. The 'Jew' passages touch nearer home. But these are not in 'Punch' but embedded in stories." Autograph Letter Signed to "Mrs Trevelyan". 27 Young Stree, Kensington Square, W., London, Tuesdau [no date]. Novelist and essayist, daughter of Thackeray (see DNB). Two pages, 8vo, remnants of mounts, mainly good condition. She is sorry she missed her but was "at the hairdressers superintending Hector's first crop". She looks forward to visiting and mentions that she "spent a very happy half hour yesterday with Fox in Fleet Street in Messrs Sampson Lows shop, so that it seemed quite natural to see yr writing." English novelist (1799-1860). On fragment of paper approximately 4 1/2 inches by 1 1/2 inches. In poor condition: creased and discoloured from previous mounting. Reads 'Your most faithful Servant, | G. P. R James'. Docketed on reverse 'March | - | Ap 28 | a 2 May'. Unpublished proof of illustration for "Henry Esmond". C. 6 x 4", in envelope, on which a description has been written as follows: "With Mr E.L. Legatts kind regard. 2 proof copies [note: only one present] from an unpublished [underlined] wood block cut by Mr swain being an illustration to Thackary's [sic] "Esmond" shewing the boy being introduced to the Lord Castlewood by the Roman Catholic priest. 1 Copy for your sister please. / Novr 05". Postmak, 2 Dec. 1905, addressed to "Mrs Walker, 36 Elsworthy Road, London, NW". autograph letters signed (x 3) to Walter Jerrold, editor, etc.